AS Logistics is pleased to be able to provide you with an accurate and timely rate for the shipping of your goods. 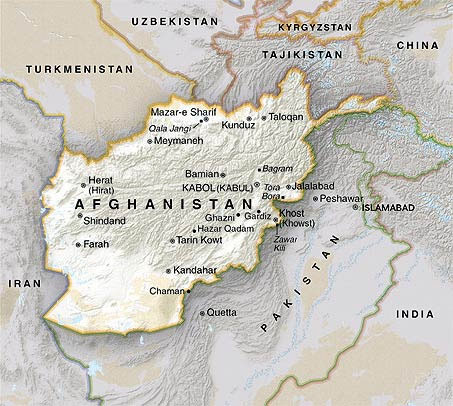 Afghanistan is a country which is land-locked and without railways, it is situated in southwest Asia, bounded on the North by Turkmenistan, Uzbekistan, and Tajikistan; on the East by China and Pakistan; and on the South by Pakistan, and on the West by Iran. Pakistan: 2,430km Tajikistan: 1,206km Iran: 936km Turkmenistan: 744km Uzbekistan: 137km China: 76km. 80 to 85% of Afghan cargo is routed through Pakistan because of the cultural, religious, ethnic and historical ties between both countries. On average about 50,000/ containers are transported annually via Pakistan to Afghanistan. In the south and east, roads link the country to Pakistan, which has the greatest volume of trade with Afghanistan. Pakistan is an important transit route for Afghanistan not only because of bilateral trade relations between the country and the longest shared border, but also due to the presence of ports in Pakistan that are used to transit goods for import to and export out of Afghanistan. A commonly used trading route between Pakistan and Afghanistan is the Karachi-Peshawar/ Torkham-Kabul highway, (distance =1655 km) and Karachi-Quetta/ Chamman-Kandahar highway, (distance = 925 km). Under a bilateral treaty signed by Afghanistan and Pakistan in 1965, the Afghan Trade Transit Agreement (ATTA), goods transiting through the Pakistani port of Karachi for import or export in Afghanistan are exempt from Pakistani duties or customs tariffs. In addition, the charges for rail or transport of the goods are required to be the same as those charged for goods destined for Pakistan. During the past twenty years, Pakistan created a list of goods exempt from the ATTA, which reached 24 exempted goods at one time. However, as a result of negotiations with Afghanistan on the issue in 2003 and later, the list has been reduced to two items. Bilateral trade relations between the two countries have improved and with greater customs checkpoints on the border between the two countries. After 9/11 incident the Government of Pakistan had made special provisions in their Custom Policy, to expedite the process for the non commercial cargo/goods for Afghanistan, for which the consignees are US, NATO, ISAF Forces, UN bodies, Afghanistan Govt., Humanitarian Agencies, Embassy, Consulates, Diplomats, International NGO’s. There is no custom duty in Pakistan for non commercial or commercial cargo/goods imported via Pakistan ports for Afghanistan, but for commercial cargo/goods custom duty is applicable in Afghanistan as per their custom rules and tariff. As per the Pakistan custom policy the commercial cargo/goods destined for Afghanistan, can only be transported by Pakistan Railway or by Trucks/Trailers of Customs registered bonded carriers’ companies. Transport by trailers from Karachi to borders i.e. up to Peshawar/Torkham for cargo destined for Kabul, and up to Quetta/Chamman cargo destined for Kandahar, and at these border locations the custom check and verification is performed. At present there are about Twenty thousand of foreign troops working under UN charter in Afghanistan, and it is increasing every year. It includes US Forces and NATO countries Forces. Apart from multi-national forces there are numerous numbers of United Nation’s bodies, International Humanitarian Agencies and NGOS organizations working in Afghanistan, under various programs and projects, funded by United Nations, World Bank, Asia Bank, & donor countries etc. The ninety percent of goods belonging to International troops and International organizations working in Afghanistan are sent from abroad. It ranges from food stuff/provisions, refrigerated cargo, Porto-cabins, spare parts, machinery, construction materials, medicines, hospital equipment etc. Eighty to Eighty-Five percent of the goods belonging to above mentioned organizations coming from abroad are routed through Pakistan Ports, because of the feasibility, and shortest distance to major cities of Afghanistan like, Jalalabad, Kabul, Kandahar, with good network of roads. There are two International Ports at Karachi, (1)-Karachi Port Trust (KPT) and (2)-Port Qasim Authority (PQA). (1)- Karachi Port Trust (KPT). KPT has 11.5km long, 12.2m deep approach channel. The port has 30 dry cargo berths, 17 of which are on East Wharf whilst 13 are on West Wharf. The total quay wall length is 4903m with varying depths of the berthing basin. Vessels up to 10.70m draft can safely be berthed at the dry cargo berths, whilst vessels up to 11.90m draft can safely be berthed at the liquid cargo berths. There are also 3nos. liquid oil piers dedicated to POL products the draft at these piers ranges from 14.60m to 13.40m. There are two private sector container terminals in this port (KPT) one located at East Wharf is known as (a) Pakistan International Container Terminal (PICT) and other located at West Wharf is known as (b) Karachi International Container Terminal (KICT). a) Pakistan International Container Terminal (PICT), located on East Wharf (berth nos. 6 to 9) began operating in 2002. It has 600m long quay length. Having 13.5m designed depth, the terminal has an annual throughput. Capacity, of 550,000 TEUs. Free time allowed for goods arriving at this terminal is seven days. b) Karachi International Container Terminal (KICT), located on West Wharf (Berth nos. 28 to 30) began operating in 1998. It has 700m long quay length. Having depth of 13.5m, the terminal has an annual throughput of 650,000 TEUs. Free time allowed for goods arriving at this terminal is five working days. The Shipping Lines calling at above two container terminals are APL, COSCO, MOL, Wan Hai Line, Yang Ming Lines, Evergreen, Hyundai, Samudera, NYK, Maersk Line, OOCL, Hanjin Shipping & (NVOCC) operators. (2)- PORT QASIM AUTHORITY (PQA). Port Qasim is located about 50km south east of Karachi and became operational in1983. It has a 45km long navigational channel. The port is well connected with the hinterland through road and rail. It has multiple berth-s having draft of 11.om, catering for dry bulk cargo, ore berth, LPG terminal, oil terminal and also one container terminal by the name of Qasim International Container Terminal (QICT). Qasim International Container Terminal became operative in 1997 and consists of berths 5 to 7. The total area of the terminal is 250,000 square meters, with a quay length of 600m and draft of 11.50m. The terminal has an annual throughput capacity of 850,000 TEUs. Free time allowed for goods arriving at this terminal is five working days. The shipping lines calling at the above container terminal are Hapag Llyod, Maersk Line, MSC, MEGA, and CMA. AS Logistics was founded in 2003 and is a privately owned an Afghan shipping, logistics and freight forwarding company located at Kabul, Afghanistan. The company has offices in all major crossing points of Afghanistan where hundreds well-trained and experienced professionals dedicate their time in delivering the best services to our clients throughout Afghanistan.